My daughter Skyler was in this. She loved it because she got to ride and walk. 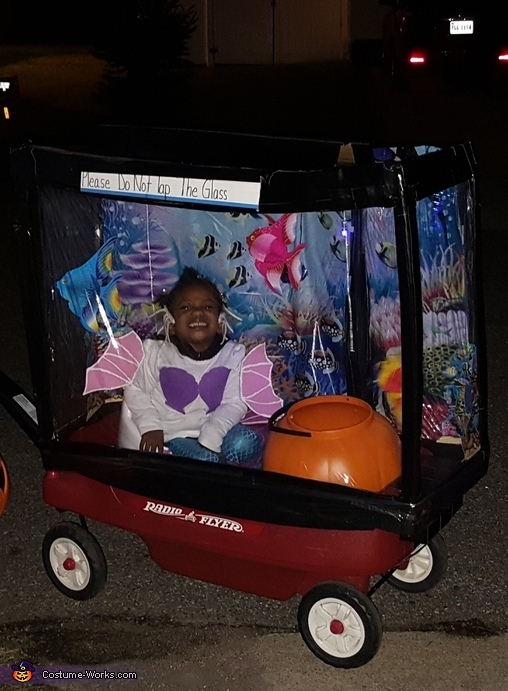 Materials:heavy duty Velcro, black gorilla tape, hot glue, card board boxes, wagon, plastic door seal(dollar tree), fish decorations (Amazon), fish background (dollar tree-was a table cloth), fish line, blue & white lights, green blanket(to cover booster seat), and booster seat. I measured the wagon and cut out my windows from 2 boxes. I used left over scrap from boxes to re-enforce my frame along with hot hot glue and gorilla tape. I then attached table cloth folded in half to back of box that wasn't cut. I attached plastic seal all around the front and sides of tank. I used a blow dryer to give it that tight glass look. This product really works. Next I added lights to the inside top of tank and attached my fish using fishing line. I attached pieces of Velcro on back side of box to allow for exit and entry and to also secure tank. I added Velcro around wagon to secure tank held up very well. Just used a piece of scrap card board to make my sign. As far as mermaid, I brought the pants from (Amazon), and glued foam fins that I cut and decorated to pants. I did the same for shells and fins on shirt.